Hello and welcome to our blog hop, if you arrived here from Doreen's blog you are in the right place. If you arrived here by chance to continue the hop click on the link at the end of this post. The 'Tis The Season collection has the traditional red and green colours of Christmas which I love. 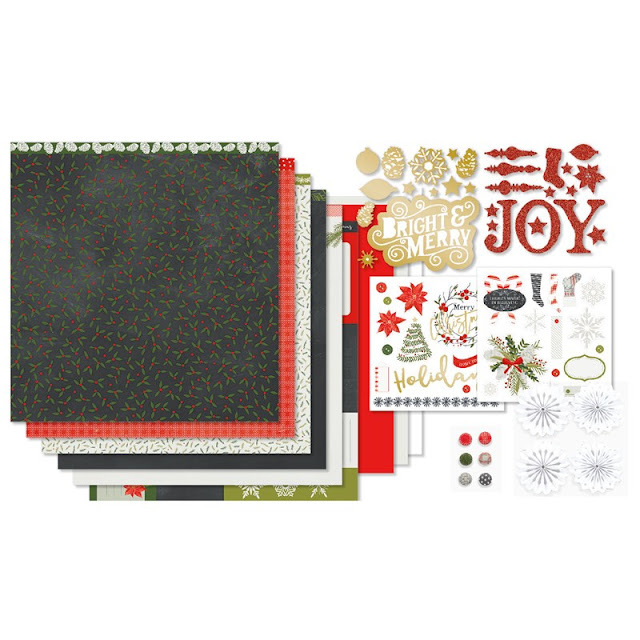 The compliments pack has some wonderful embellishments which will really enhance your projects. I love spending Christmas morning with my sister and her family. I arrive early so I can see the kids opening their presents, it's wonderful to see the delight on their faces when they realize they received what they wished for. After opening the presents we share a big breakfast together. In the compliments pack there are these lovely white rosettes, I knew I would never use them for scrapbooking but thought they would be great for a 3D project. Pinterest is a great source of inspiration and I came across an idea to make ornaments with them. I have used the gold glitter and cranberry cardstock and decorated them with various stamps. A little bling for added sparkle and some gold cord to hand the ornaments and the project is completed. Never think that you can only use the papers in the kits for the theme they are designed for. The pale black paper with the snowflakes created a bit of a challenge for me, I thought it would look lovely with the bashful cardstock. So I created this card and used the snowflake paper for the background. I used Bashful ink for the flowers, Canary for the centers of the flowers and Fern for the leaves. Thanks again for stopping by to continue the hop go to Shaunna's Passionate About Pages . I am sure she has something wonderful to share. Please take a moment and leave a comment before you head off to the next blog. All comments are gratefully accepted. Beautiful Doris - I especially love how you've decorated the snowflakes. More great ideas, Doris. I love how you used the paper from this pack for a non-Christmas card! Thanks Doreen, I really enjoy seeing ideas that use the papers in ways other than the theme of the collection. Thanks Shaunna, you are most welcome to copy the ornament ideas. You clever cookie, I am smitten with your snowflake ornaments! Thanks Kara I was very happy when when I came across the idea of the ornaments on Pinterest. I love love love how you decorated the snowflakes & the way you used the "snowflake" designed paper with flowers - the card looks so pretty & I no longer notice that the paper looks like it has snowflakes on it. Thank you Maz, I love finding ideas for the collections that are different from how they are intended to be used. I absolutely love what you have done with the rosettes and that black and white paper is such a stunning background on your card! Thanks Lauren, when I started the card I didn't even realize there were snowflakes in the background.